What do Katie-Rose, Yasaman, Milla, and Violet all have in common? Other than being named after flowers, practically nothing. Katie-Rose is a film director in training. Yasaman is a computer whiz. Milla is third in command of the A list. And Violet is the new girl in school. They’re fab girls, all of them, but they sure aren’t friends. And if evil queen bee Medusa— ’scuse What do Katie-Rose, Yasaman, Milla, and Violet all have in common? Other than being named after flowers, practically nothing. Katie-Rose is a film director in training. Yasaman is a computer whiz. Milla is third in command of the A list. And Violet is the new girl in school. They’re fab girls, all of them, but they sure aren’t friends. And if evil queen bee Medusa— ’scuse me, Modessa—has her way, they never will be. But this is the beginning of a new school year, when anything can happen and social worlds can collide . 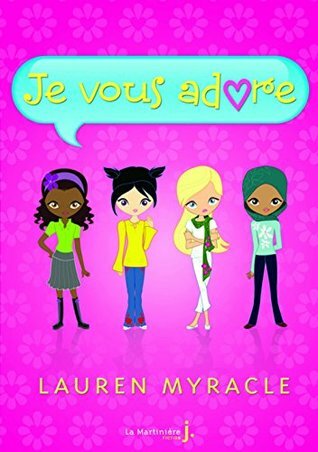 . . Told in Lauren Myracle’s inventive narrative style—here a fresh mix of instant messages, blog posts, screenplay, and straight narrative—Luv Ya Bunches, the first in a four-book series, is a funny, honest depiction of the shifting alliances and rivalries that shape school days, and of the lasting friendships that blossom from the skirmishes.